It's been a while since I posted movie reviews on my blog. Heck, it's been a while since I watched movies! How does a movie buff who is also a screenwriter not watch movies? That's sheer sacrilege. Well, life (and deadlines) have a way of getting in the way. But let's not dwell on that. The other Big Plus about watching movies via streaming channels is that you can simply watch the first 10-15 minutes of a film and decide whether it grabs you enough to see the rest of it. So, here are the top two movies that grabbed my attention...interestingly, both are adaptations. 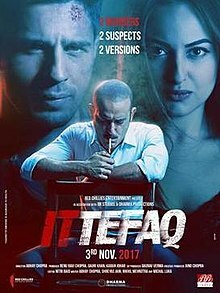 Ittefaq (directed by Abhay Chopra) is a taut thriller that is an adaptation of a 1969 film of the same name starring Rajesh Khanna-Nanda. I call it an 'adaptation', rather than a remake, because there are many differences in the storyline and the new version with Siddharth Malhotra and Sonakshi in the lead roles is a much more taut and well-told story. A famous novelist Vikram Sethi (Siddharth) is on the run from the police. After he is grabbed by the cops it turns out that Vikram's wife has been found dead. Moreover, he is also a prime suspect in the murder of a man in an apartment where he had taken refuge. Two murders involving the same man in one night? Too much of a coincidence thinks the investigating police officer Dev (brilliantly played by Akshaye Khanna). The drama piles up as new revelations come to light and each one has a twist to it. Saying anything more would be a spoiler and detract from the enjoyment of the film. A wonderfully adapted film that keeps building on the suspense and keeps you watching till the very last frame. This surely ranks on the top of my list among Bollywood crime thrillers -- second only to another well told mystery/crime story, Reema Kagti's Talaash. I'm a sucker for romance movies, especially the Bollywood kind. Sadly though, enjoyable, feel good romances have become a rarity in today's Bollywood. 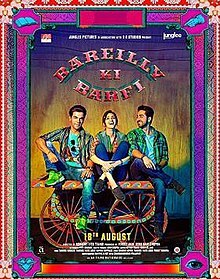 So, Bareilly ki Barfi (director: Ashwiny Iyer Tiwari) was just what my romance-starved movie buff soul needed! It has the right amount of sweetness and tartness. The story is an adaptation of Nicholas Barreau's book 'The Ingredients of Love'. Amazingly enough, the original story which is set in Paris has been relocated to small town Bareilly with all its local colour, lingo and quirky characters. Bitti (Kirti Sanon) is a small town girl with loads of attitude. She works in the customer service department of the local electricity utility company, occasionally smokes and hates the fact that as a girl she is constantly under pressure to "get married". Her father is more indulgent (the right mix of traditional and yet unconventional dad) while her mother keeps a sharp look out for potential grooms for her daughter. The moment she spots one, she plies him with juice! Enter, Chirag Dubey (Ayushmann Khurana) owner of a printing press, a broken heart and author of a self-published book about the love of his life Babli. When Bitti reads the book, she wonders if Babli is based on her and if so, how did the author (Pritam Vidrohi) know so much about her? Bitti is directed by the bookseller to Chirag who has published the book under his friend Pritam's (Rajkummar Rao) name much against the latter's wishes. 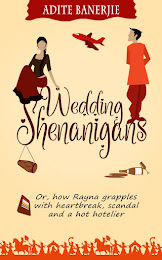 Now, Bitti wishes to meet the author of the book and Chirag coaxes -- rather bullies -- the reluctant Pritam to meet Bitti. What follows is an entertaining, comedic romantic drama. It's a well told tale with just the right amount of comedy, drama and romance to spice up the story. Don't miss it! After watching both movies, it occurred to me that both had writers as their protagonists. What an 'ittefaq' (coincidence)!! Have you seen any great movies lately? Do share so that I can put it on my "watch list"! Both movies sound interesting. Checking them out soon. I'm sure you'll enjoy them. Thanks for reading, Preethi! Writers as protagonists — I always love that, being a writer myself. I do too...but it's kind of rare, isn't it? Thanks for reading, Sue. As a thriller writer yourself, you'll love Ittefaq. Thanks for reading, Ruchi. This is great - I now want to watch both of these! You'll love them, Reet...Thanks for reading!